The World Chess Championship 2010 took place in Sofia, Bulgaria from April 21 to May 13. World Champion Viswanathan Anand defends his title against challenger Veselin Topalov. Veselin won the Candidates Match 2009 versus GM Gata Kamsky and became challenger. Games can be replayed below. Get DVD's about World Champion Anand's Career here. Topalov sacrifices his knight and gets an overwhelming attack and wins! Great play! Anand wins complex late middlegame position after having sacrificed a pawn in the opening for better piece play. The Queen was exchanged early and the remaining middlegame didn't offer many opportunties to win. The position ended finally in a draw. This game is simply incredible! Anand played the Catalan again and sacrificed a knight at the kingside and gained an unstoppable attack. An incredible game, I just love it! Repetition of game 3 until move 15. Early queen trade off. Game was well balanced throughout and ended in a draw. This variation has been played in game 2 until move 10. In this game Anand selects the move 10.Bg5 instead of 10.Bd2. Topalov sacrifices a rook for bishop and attacks permanently the weakened kingside. Anand defends precisely until a draw is reached. Repetition of game 3 until move 13. Early queen trade off. Topalov had the initiative throughout the game and was finally winning a pawn and entered the endgame with different colored bishops and won a difficult position. Great play. 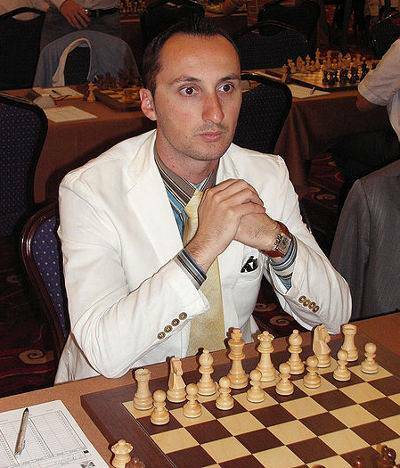 In this game Topalov traded his two rooks for the queen and entered a very complicated game. Anand plays same variation as in game 1, but deviates at move 10 playing 10...b6 instead of 10...Na5. The game was well balanced and ended in a draw. Anand played the English Opening for a change. The position was even until the endgame where a draw was reached. Anand had a strong bishop pointing towards Topalovs kingside. To blast open the diagonal for the bishop he sacrificed a pawn and gained an unstoppable attack.